Files : Welcome to the VintageSaws.com Online Store! It's been a bumpy ride here at VintageSaws.com as it relates to the files we have carried. Over the past 17 years we have been supplying sawyers with files to keep their saws sharp including files made by Simonds, Sandvik and Grobet brand files. Change is underway again, and we are transitioning to Nicholson Brand Files. Grobet recently changed their production from Switzerland and the quality of the current product does not meet our standards. After a short search, Nicholson in my view is the current best option. Nicholson has been making files since 1864 and the quality is excellent. One small caveat, Nicholson files are no longer made in the US, most are made in Mexico. In talking with the sales rep, the cost to make files became so expensive with US labor, that they decided to move the entire facility to Mexico. It was done with an eye toward quality. The plant uses the same production equipment that used to sit in Providence, RI. The plant is also managed with US workers. The proof is in the file, however, not where it's made. After ordering samples in the sizes I typically carry, I was surprised by how sharp the corners are and overall quality. It's a first rate product. It's important to note that since we use quite a few files ourselves, if we don't use them, we won't sell them, it's just that simple.We will begin substituting Nicholson files for the Swiss made Grobet files until all the Grobet files are exhausted. This change is exciting for other reasons in addition to the quality. By carrying Nicholson brand files, we will have access to their entire line including the coveted #49 and #50 patternmaker's rasps. Look for new offerings coming soon! Below you will find a wide selection of files that completely encompasses all the files needed to sharpen saws from 4-20 points per inch (ppi). Look in the table to find out which file you need for the saw that you have. 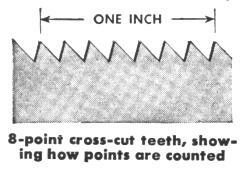 To determine how many points per inch your saw has, take a ruler and align the inch marks on the cutting tips of the saws teeth. Count the number of points that fit into the inch on the ruler as seen at the left. You may also find that the number of points per inch is stamped near the heel of the saw. Then look in the table and pick the file that is right for the saw that you have. In general, the shorter the file, the finer teeth it can file. For any given length of saw file there are four tapers: Regular Taper, Slim Taper, Extra Slim Taper, and Double Extra Slim Taper. For a given length of file, the more tapered the file, the finer the saw teeth you can file. If all this is confusing, don't worry. 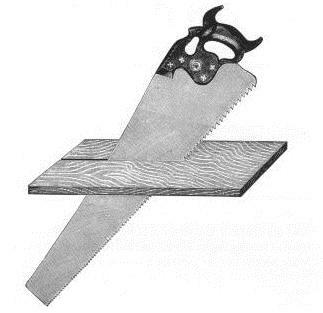 The files recommended below are the ones that I use for the saws that I file for sale here at Vintage Saws. I have over 24 years of experience using files, and they are guaranteed to work. 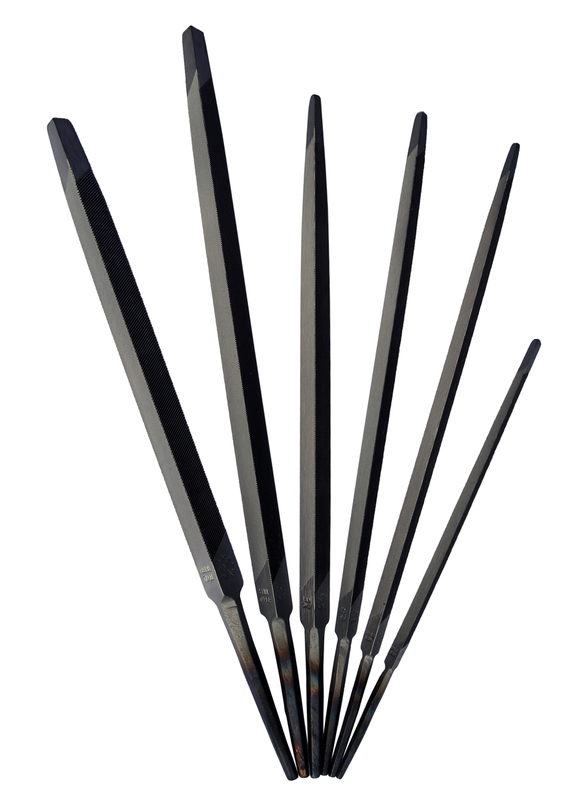 In addition to the wide selection of saw files, we are also proud to offer several other files and rasps that woodworkers sometimes need. A brief description of each is included with each photo below with some comments from me to help you make a selection. As an added incentive, you will notice several samplers that I have included to maximize your savings. A flat shipping rate of $10.00 applies to every order. No matter how many or how few files you purchase, this is the shipping charge that applies. Vintage Saws ships via Fedex Ground or USPS Priority Mail. A tracking number is sent at the time of shipment from Fedex or the USPS. This is proper file to sharpen saws with 6-7 point teeth. First Quality Nicholson Brand. This is proper file to sharpen saws with 8 point teeth. First Quality Nicholson Brand. This is proper file to sharpen saws with 9-10 point teeth. First Quality Nicholson Brand. This is proper file to sharpen saws with 11-15 point teeth. First Quality Nicholson Brand.